If you are wondering that these Rebrand, Re-badge and Refresh terms associated with graphics cards mean then you are at the right place. These terms are closely related to each other and there is a lot of confusion on what they really mean in context to graphics cards. If you are graphics card user or are in process of buying a new graphics card then you should know about them so that you can make a wise decision when buying a new graphics card or upgrading it for you gaming PC. There is a very thin line between them and most of the people use them interchangeably without knowing the actual difference between them. So, here I am doing to demystify both these terms i.e. Rebrand / Rebadge and Refresh for graphics cards. It is also important to note that they are not used with all graphics cards but only for some graphics cards and these terms are used with both Nvidia and AMD graphics cards. Rebranding or Rebadging of graphics card means selling the same graphics card with a totally different name or branding under the impression of a newly launched product. For example, selling a GTX 680 graphics card with a new branding and name under GTX 770. The new rebranded graphics card will have a different name but the same GPU chip, GPU architecture and number of Shaders / Stream Processors / Cores as the older one. Both rebranded and original graphics cards will have the same features and almost the same level of performance. The rebranded card may feature a new cooler and output ports for connectivity. The GPU clock speed and Memory clock speed may or may not differ on the rebranded graphics card but most of the times memory configuration remains the same in both the cards. Also, the power consumption can be slightly different too but not that much. 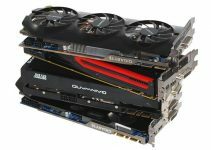 The price of the new re-branded graphics card can be a little higher or lower than the original one depending on the graphics card manufacturer. So, overall rebranding is a just a new packaging and name of older graphics cards to sell them as a newly launched product. Rebrand and Rebadge means the same thing. Below are some of the rebranded or rebadged graphics cards from Nvidia and AMD. Note: Rebranding of graphics card should not be confused with the different brands of graphics cards from various third party graphics card manufacturers or board partners. A refresh means that the newer graphics card comes with some improvements and features over the older one. It is an updated version of the older graphics card and offers better performance, power efficiency, features and resolved bug fixes that were present in the older graphics card. Both the graphics cards will have the same GPU architecture but the GPU present in the refreshed one will be a slightly updated variant of the older one. GPU manufacturer may unlock extra cores in the newer card and thus making it more powerful. The manufacturing process in the refreshed GPU can also be smaller e.g. from 14nm to 12nm. Also, you will definitely get higher GPU and Memory clock speeds in the refreshed graphics card. However, the memory size and configuration may or may not remain the same as GPU manufacture may put more memory on the refreshed graphics card. Just like rebranded or rebadged graphics card, a refreshed graphics card is also sold as a newly launched product with a different brand name. The refresh card may come with better overclocking potential, power management features, improved efficiency and newer technology support. Also, the drivers are better optimized for the newer refresh variant. The power consumption of the refreshed graphics card can be a bit on the higher side because of higher clock speed and other additions. It may also get a new board design and a cooler. Generally, refreshed video cards are priced a bit higher compared to their older or existing variants. A refresh is just like a revision where some minor improvements are made over the previous GPU or graphics card. It is to be noted that rebrand is used for a particular graphics card but refresh can be used for single a well as for the complete graphics card family or series. For example, the Radeon RX 500 series is a complete refresh of the older Radeon RX 400 series from AMD. The RX 400 and RX 500 series cards are built on the Polaris GPU architecture but RX 400 uses Polaris 10 series GPU and RX 500 ones use Polaris 20 series GPU which is an updated version or revision of the older Polaris 10 GPU. 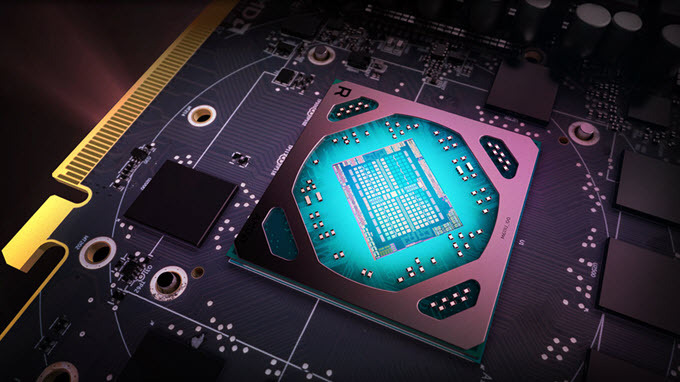 For example, Radeon RX 480 uses Polaris 10 chip while the Radeon RX 580 is built using the Polaris 20 chip. The main thing that is common between rebranded and refresh graphics cards is that both these type of graphics cards have the same GPU architecture to the cards from which they are derived from. You can compare the graphics card and GPU specs by using the graphics card comparison websites and can find out more about them. Rebrand / Rebadge is taking an older graphics card preferably from previous generation and selling it as a newer product under different name. The newer card will have the same GPU chip and architecture and may be some clock speed changes while the core specs remain the same. On the other hand, a refresh is an updated version of the previous generation graphics card with some minor enhancements related to features, performance and efficiency. The GPU chip will be the revision of the previous chip with different code name but will have the same GPU architecture. Important Note: A graphics cards with a completely different GPU architecture is not a rebranded, rebadged or refreshed card. It is a completely new product having its own identity. For example, two graphics cards G1 and G2 with same number of CUDA Cores or Stream Processors but with different GPU Architectures (GA1 and GA2) does not qualify as Rebrand, Rebadge or Refresh. 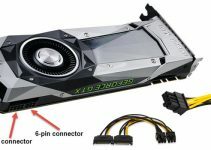 They are totally different graphics cards with no connection or correlation between them except that one will be a successor of another in terms of GPU architecture or family. Why GPU Manufacturers do this? All the GPU manufacturers and chip makers i.e. Nvidia and AMD use these tactics (rebrand/rebadge and refresh) to cut their cost and increase life-cycle of a product because a new chip design and architecture costs a lot of money, resources and time. Also, if don’t launch a new product in the market after a period of time then their reputation takes a hit and they will be risk of losing customers because other manufacturer can take advantage of this situation by launching new products (rebranded or refreshed) at the same time. So, to tackle this they recycled their older products or technologies and pack them as newer one with a different brand name e.g. 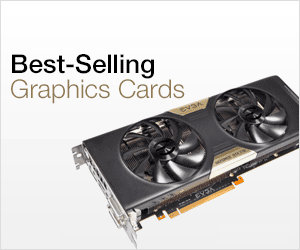 a high-end graphics card from previous generation can be sold as a mid-range graphics in the current generation with a different name, cooler and slightly different specs. It also allows them to clear their older stock of chips and sell them at the same price as before. Well, this may sound unethical sometimes but it is very common tactic used my many chip manufacturers and we cannot blame them unless they are doing it more often or for a longer period of time and delaying completely new products for a long duration. 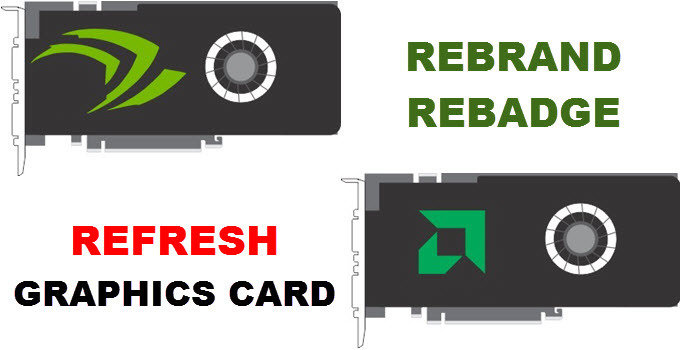 Well I have tried my best to explain these Refresh / Rebadge and Refresh terms associated with graphics cards. They are a bit confusing because they may be confused with each other even by some of the professionals in the tech business. If you have anything to say, suggest something or have any queries then please leave a comment below. Thanks for sharing this valuable information. I am a graphic designer and it is very helpful for me.